Linkkoin (Linkkoin.com) is an unverifiable and relatively unknown cryptocurrency exchange that is starting to make some headway across the net. The community feedback regarding Linkkoin is virtually non-existent while the credibility of Linkkoin is still under evaluation. To find out more regarding this suspicious cryptocurrency exchange, we invite you to read our unbiased review. 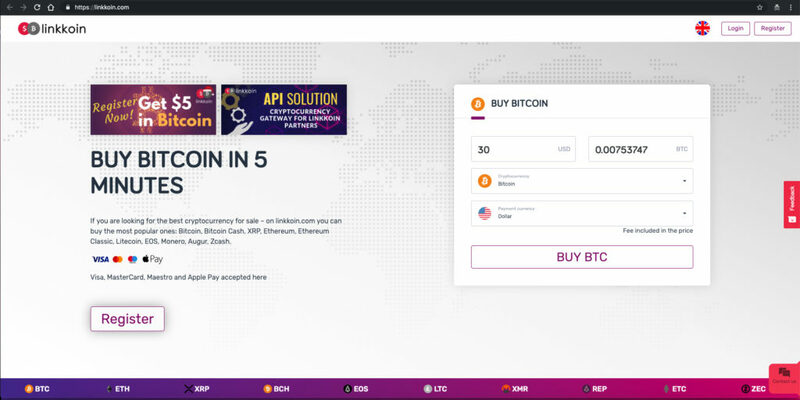 Linkkoin is an online platform which states that you can buy Bitcoin in 5 minutes. There is no reference to what Linkkoin does, what their mission is nor that they alone are an exchange, although we believe the last one is reasonably easy to deduce. Unlike many reputable exchanges that are operating within the parameters of good-standing, Linkkoin fails to reflect much of a history of verifiable user feedback. Their platform fails to incorporate a cryptocurrency ledger so that crypto investors can rest-assured knowing that their platform is truly paying. According to their homepage, Linkkoin currently accepts Visa, MasterCard, Maestro and Apple Pay for payment methods. Their site implies that they have 9,626 registered users with over 15,000 transactions conducted to date. Whether this is true or not we are unable to verify since Linkkoin fails to provide us with a simple payment ledger to verify that they are indeed living up to their word. Investors who utilize this platform can only purchase up to $1,000 in select cryptocurrencies during any one transaction. Linkkoin implies on their home page near the footer of their site that they are overseen by the corporate entity UK Capital First Limited. According to a CompaniesHouse report, UK Capital First Limited is registered under the company number 11027474 and was incorporated on October 23rd, 2017. Safwat Adly Eprahium Bassem is disclosed as the Director behind UK Capital First Limited while the correspondence address of Mr. Bassem is the same as the registered office address of UK Capital First Limited. When researching the registered address of UK Capital First Limited, we were unable to verify the legitimacy of the location since only partial segments of the address appear to come up as an existing location. However, when searched you don’t see a corporate building indicating UK Capital First Limited, instead you’ll encounter what appears to be residential apartments. It is imperative that you bear in mind the fact that many illicit and fraudulent ‘cryptocurrency investment companies’ are heavily relying upon the easily deceptive UK corporate structure as a credibility builder. Now that isn’t to insinuate that all UK based corporations are illegitimate, it is just an excessively utilized way that non-legitimate investment ventures have been incorporating in the attempt to appear more legitimate. Also remember these UK corporations are exceptionally easy to look up while most of the registered addresses that we encounter, along with the alleged entities behind these corporations, are non-existent. Before any cryptocurrencies can be bought or sold at Linkkoin.com, investors are required to create an account. From there, users have the ability to buy up to $1,000 worth in Bitocin, Bitcoin Cash, XRP, Ethereum, Ethereum Classic, Litecoin, EOS, Monero, Auger and ZCash. Linkkoin does not disclose any upfront information regarding whether their platform charges any specific fees or withdrawal minimums and maximums. To add, unlike the majority of legitimate cryptocurrency exchanges currently available online, Linkkoin does not disclose a transaction ledger for prospective investors to verify that Linkkoin is in fact operating by-the-books. Withdrawals are said to take a little over an hour to conduct while users are allegedly able to buy Bitcoin in 5 minutes. Linkkoin.com was registered by UK Capital First Limited on March 9th, 2018 through the GoDaddy registrar. According to SimilarWeb, Linkkoin reflected a global rank of 4,949,573 with a UK rank of 1,011,281 as of January 14th, 2019. It does not appear that Linkkoin receives much incoming traffic given their relatively poor web-rankings. Is Linkkoin.com a Trustworthy Exchange? The verdict regarding Linkkoin is still under evaluation, however, we do feel that there are much better alternatives readily available which have been verified as legitimate. There are still several unknowns regarding the legitimacy of Linkkoin. While our research failed to provide us with a clear-cut verdict regarding Linkkoin, we believe that the information shared in our review above provide us with a clear enough picture that there are much safer alternatives available. With this in mind, we are not recommending Linkkoin for the time being and encourage investors from all walks of life to pursue more legitimate alternatives. We invite you to share any insight, feedback or experiences you may have below! ive registered with linkkoin.com recently, and ive deposited money into my account on linkkoin.com within 5 minutes, But when i tried to verify my account with visa debit card, and my passport, it just keeps on crashing and when i send emails and chat online they replied twice saying java needs turned on (which i have java turned on) and second they said contact support, hich dont even bother to reply back, my money is still in my account, But i cannot withdraw or send it to my other wallet. so i would deffo say this site is a scam. Hi Tim, I dont even know what you wrote, why? I am using them since half year or from the beginning? You can buy crypto instantly by card, my verification tooks 10min, and you can’t sell with them but you can withdraw to your wallet so wtf? Did you even bother to check their terms and conditions? Or like made a transaction with them? Because if you had, you would have mentioned that they have obligatory verification. I am using them since last October. Satisfied so far. There are no withdrawal fees from them. And you can easily check their overall fees by comparing prices from coinmarketcap and their website. It seems that the author has never used the platform. On this exchange there had never been an option to sell cryptocurrencies. Only to buy them. And as a user yes, you can buy cryptocurrencies in less than five minutes. My last transaction actually took less than 2 minutes (card details with autofilling). And if you ever tried to buy there, you will see the limits of transactions in the transaction window.